Especially in the summer when the weather is warm, flea markets are a great way to spend a lazy Sunday afternoon. Split $50 evenly between the four of you. The challenge? Scavenge through boxes and bags for hidden vintage treasures. See which couple can come up with the kookiest, wackiest find. Game night was made for double dating couples! Invite another couple over for a laid-back hang out of playing board games, charades or, if you’re feeling a little risque, strip poker. To break the ice, start out with a game of ’20 Questions’ — whether you’ve been together for twenty years or two months, there’s always something new to learn about each other. Tag team with your S.O. on a multi-player video game like Wii Olympics or Super Mario Brothers — they’re fun and totally free. Even if you aren’t pros, you can still tee off at the golf course (the mini golf course, that is). Sure, it’s a tad cheesy (anyone having high school flashbacks? ), but that’s the fun of it! To make it feel more grown-up, make the losing couple buy a round of drinks. Single bikes? Boring. Tandem bikes for two? Well, it’s not enough for four! Instead, zip around town in a quadracycle — a four-wheeled bicycle for two or more people (in other words, it’s perfect for two couples). You can work together, taking turns as a couple at the helm of the bike or have the guys at the driver seats, pedaling away, while you ladies recline and relax in the back. Wine tastings can be a little out of your date night price range, especially if your a cash-strapped couple … that is, unless you can find a way to split the costs. Have each person bring a bottle of vino for a swanky home soiree. What could be more romantic than a well-deserved vaca for two? Try adding another couple to your travels! One couple can navigate map-in-hand while the other couple can drive. 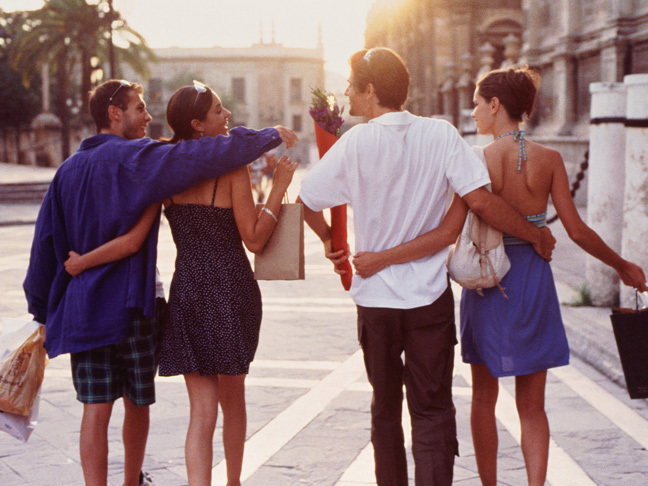 You’re less likely to suffer those awkward silences in the car and you’ll feel safer traveling in a group. And if anything, it’s nice to have a friend who’s willing to take your photo instead of having to flag down other tourists or taking an awkward couple selfie on your own. If you and your couple friends are adrenaline-junkies, there’s nothing like paddling through white water rapids downstream. Rafting is fun, but it takes coordination and teamwork — making it perfect for adventurous double-dating couples. If you’re pros, go head-to-head with another other in a race of couple versus couple. If all else fails and you’re fresh out of date night ideas, scour through social discounts on sites like Groupon. Pick something none of you are familiar with whether it be salsa dancing or an Italian cooking class. That way, you can all laugh your way through it and having plenty to talk about on your next double date together.